Webinar — Rethinking Efficiency: Savings, Value, or Both? The Center’s webinar focuses on how to talk about the value of public health with a variety of audiences, including policymakers. The Center for Sharing Public Health Services held a webinar November 7, 2014, that focused on how to talk about the value of public health with a variety of audiences, including policymakers. 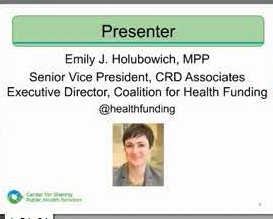 The presenter was Emily J. Holubowich, MPP, Senior Vice President at CRD Associates and Executive Director of the Coalition for Health Funding. The webinar is posted on the Center’s website. Highlights from the webinar follow. Talking about return on investment (ROI) often doesn’t resonate with policymakers. ROI generally focuses on future cost savings, which are based on projections. Lawmakers often don’t trust projections. In addition, they want to see results now. Talking about return on objectives (ROO) is more about answering the question of whether or not a program achieved what it set out to do. When developing a program, it is important to set short-term and long-term goals. Monitor progress toward those goals, then communicate with policymakers about that progress. ROO is less fiscally focused than ROI. It is part of a growing movement to think about efficiency as more than just dollars saved. Instead efficiency means maximizing the value of any dollar spent in relation to a defined public service or objective. It is important to remember that the mission of public health is to improve health. Therefore, messages should focus on health outcomes, not just on cost savings. A great way to shift the conversation from ROI to ROO is to show policymakers how a program is working. Data is important for context, but a story about one citizen who was helped by a public health intervention can be just as powerful. Personal stories make policy relevant and tangible. Stories can provide a connection with the policymaker on a personal level. Data make a conversation credible, but stories make it memorable. Most of the time, the goal is not to help a policymaker understand public health completely. Instead it is to help them understand aspects that are relevant to their constituents. Show them what is or could negatively impact health in their community, and then show them the programs that are working to fix those things. It is important to know your audience. With policymakers, that means realizing they are motivated to make a difference in their constituent’s lives yet are often forced by limited funds to make difficult decisions. When lawmakers see something as a priority to their constituents, they are more likely to spend money. They also want evidence of a program’s impact that they can share with constituents now. Policymaker’s ideology and moral beliefs often drive their decision-making. If evidence conflicts with their beliefs, some hold on to their beliefs more strongly. Coming at someone with evidence that challenges their beliefs is often like telling them they are wrong. A better approach could be to ask them what they know about a topic, and then fill in any gaps in their knowledge with evidence. Before talking to a policymaker, it is important to know their priorities. Every aspect of living can be connected back to public health. Is the policymaker interested in reducing disparities? Let them know how the program can do that. Is he or she interested in workforce development? Let them know how this program meets that goal. Connecting public health back to things that are important to policymakers can be powerful. Consider who will have the most impact in delivering the message. Would a policymaker be more likely to listen to a business leader than to a public health official? Does anybody involved with a program already have an established relationship with the policymaker? Determine who would have the most impact, then ask them to deliver the message about ROO. As stewards of taxpayer dollars, it is the responsibility of public health officials to be accountable and transparent. Consider efforts to inform policymakers to be educational, not advocacy. View the entire webinar on the Center’s website. Note: The webinar provides some general tips on effective approaches for advocacy and education on policy-related topics. Before using them to craft any particular message or communications strategy, it is important to understand the rules that may apply to policy advocacy for your organization and the funding you receive from RWJF and others. There are many free resources that you can consult for more information.